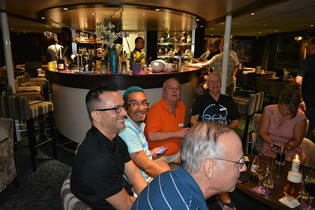 10-day all-gay European vacation beginning in Zurich, Switzerland, featuring 7 night Rhine river gay cruise on elegant Amadeus Silver III ending in Amsterdam, Netherlands. Discover the many beautiful facets of the Rhine River during this week long cruise along one of the most attractive rivers of Europe. 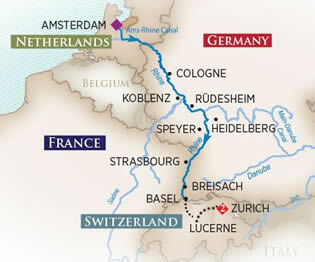 Take a front-row seat on this enchanting journey along the Rhine to magnificent cities and charming villages alike. Delight in the panorama of the myth enshrouded Rhine Valley with its vineyards, the fabled Lorelei rock, and the highest density of castles in the world! 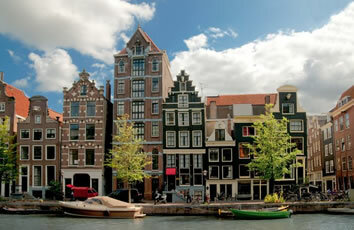 Grand cities blend in perfect harmony with their historic past and progressive future in Basel, Cologne, and Amsterdam. 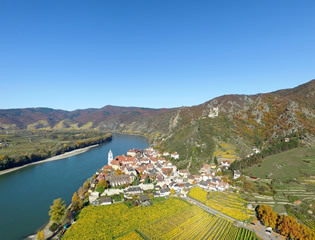 Delight in the panorama of the myth enshrouded Rhine Valley with its vineyards, the fabled Lorelei rock, and the highest density of castles in the world! 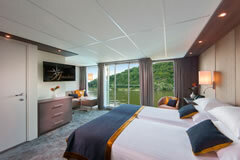 On board the ms Amadeus Silver III, you will be pampered by a crew of forty in an atmosphere of total relaxation. 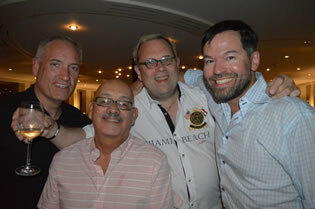 With this great riverboat, we've created an itinerary that includes two of Europe’s most popular cities which have become prime destinations for gay and lesbian travelers. A trip on board the elegant Amadeus Silver III combines the luxuries of a 5-star hotel with innovative design and the first-class service of our crew, who will attend to your every wish. It has 12 luxurious suites with walk-out balconies, while the majority of the cabins have automatically lowerable panorama windows, offering a spectacular view of the passing river landscapes. 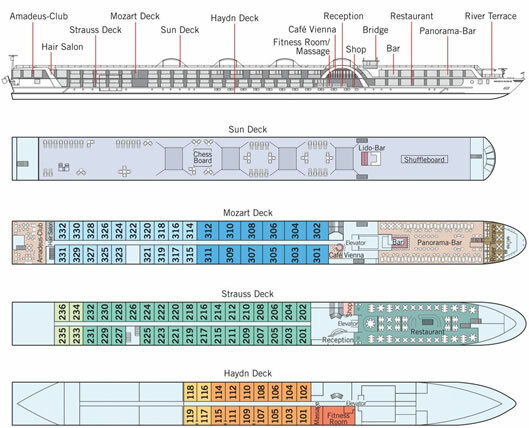 In order to make your stay on board as comfortable as possible, all cabins have a modern bathroom and a walk-in closet. The glass-shielded River Terrace invites you to relax outdoors, while offering a breathtaking view of your surroundings. Enjoy the highest standards of cuisine aboard the Amadeus Silver III in the stylish Panorama Restaurant, which offers sufficient room for all passengers at one sitting, and where our kitchen crew will ensure that you are spoiled beyond your expectations. Coffee-lovers will enjoy the on-board Café Vienna, which offers a wide variety of authentic Viennese coffee-time specialties. Arrive in Zurich and transfer to your hotel. The balance of the day is free time to start exploring this beautiful city. 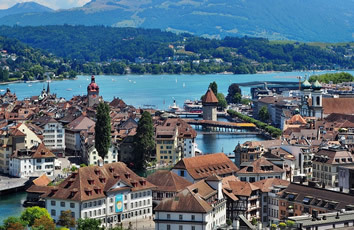 After breakfast at the hotel, enjoy an included full day tour to Lucerne featuring a boat cruise. Lucerne, the gateway to central Switzerland, sited on Lake Lucerne, is embedded within an impressive mountainous panorama. Complete with gable paintings, the covered, medieval Chapel Bridge forms the centrepiece of Lucerne’s townscape and is considered to be one of the oldest, covered wooden bridges in Europe. 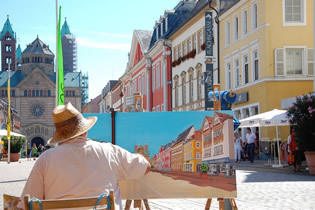 Historic houses decorated with frescoes line the picturesque town squares as they do the ‘Weinmarkt’ square in the car-free old town. Lucerne is a city of town squares and churches. Enjoy an included 1/2 day tour of Basel before embarkation. 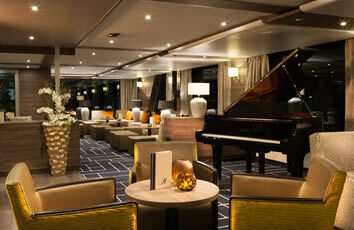 Your floating hotel departs for Strasbourg shortly before the Welcome Dinner on board. Home to 40 museums, the city of culture for connoisseurs has the highest concentration of museums in the country. Basel also has a beautiful Old Town, modern architecture, and the Rhine – an inviting spot to rest a while. Basel is Switzerland's oldest university city. Historic landmarks of the city include the large market square with its richly decorated red sandstone town hall and the late Romanesque-Gothic cathedral. During a walk through the old town, past small boutiques, antique book shops but also shops of modern designers, a visit to the "Läckerli Huus" to try the traditional Basel honey cake is well worth your while. 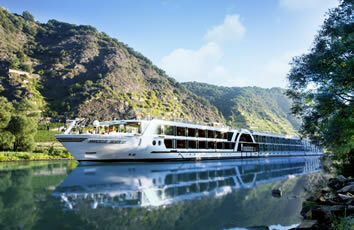 During the night, your ship left Switzerland and followed the Rhine into the Alsace region in the south of France. 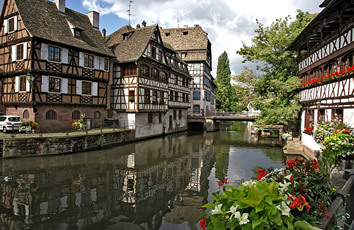 During breakfast, arrive in Strasbourg – a city known not only for its romantic old town, but also for the numerous important European institutions housed there. In the morning, explore the city independently, or as part of an organised tour. A detour to the countryside is highly recommended, particularly along the famous wine route, where the quaint wine-growing villages will delight wine-lovers and the general public alike. Late tonight, your ship departs for Germany. Before breakfast, arrive in the Rhineland-Palatinate town of Speyer, which played an important role in the Holy Roman Empire during the Middle Ages. Your ship remains here until lunchtime, offering time to explore this historic destination. Your trip continues towards Mannheim, our next stop along the picturesque Rhine for the remainder of the day. This young city is best explored with an extended walk, or alternatively you can take a trip to the nearby city of Heidelberg, which boasts a beautiful Baroque old town. Late at night, your ship continues in the direction of Rüdesheim. Two charming stops await you today. In the morning, arrive in Rüdesheim, a town well known for its winemakng, especially Reisling wines. Nearby, Siegried’s Mechanical Music Cabinet with its historic automated musical instruments is a delight. Your Amadeus ship will depart punctually at lunchtime, to cruise the most beautiful section of the river – the legendary Upper Middle Rhine Valley. The view from the sun deck, of the myth-enshrouded Lorelei, is sure to be a highlight of your cruise. Shortly thereafter, we arrive in Koblenz, one of Germany’s oldest and most beautiful towns, where you can end the day with a leisurely stroll through the city. The vessel departs Koblenz in the early hours, and makes a detour along the Mosel River to the most romantic part of the valley and the little town of Cochem. The magnificent Reichsburg castle is situated high above the town, dominating the landscape. Down below, the village with its narrow streets, half timbered houses, and numerous restaurants are an ideal setting to taste the wines of the region. Back on board dinner is served as the journey continues to Cologne. 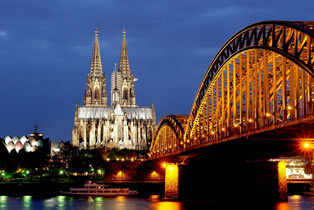 The morning is dedicated to the fascinating city of Cologne, which has over a million inhabitants. You can expect a young, vibrant metropolis with a rich cultural history and many world-famous sights, in particular the famous Cologne Cathedral. A city tour here is a must for everyone with a cultural bent. After lunch, your floating hotel departs Cologne. The afternoon is spent on board and in the evening, the captain invites you to a festive Gala Dinner, full of wonderful regional dishes. By lunchtime you will have crossed yet another country border to arrive in the Dutch town of Hoorn. This picturesque village is a jumping off point for the optional overland trip to the north of Holland and Amsterdam. 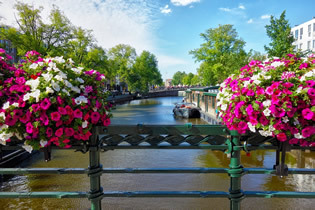 For those remaining onboard, discover the beauty of the Dutch Watwerays as the ship glides toward the capital city of the Netherlands, where it will remain docked for the evening. Departure day. Transfer to airport for your departure flight. 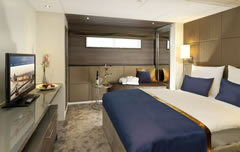 Additional post hotel nights are available if you would like to extend your time in Amsterdam. • Itinerary with stops in four countries. • Zurich – the largest city in Switzerland. • Lucerne – preserved medieval architecture amid snow-capped mountains. • Basel – the gateway to the Swiss Rhineland. • Strasbourg Cathedral – one of the finest of Europe’s great Gothic cathedrals. 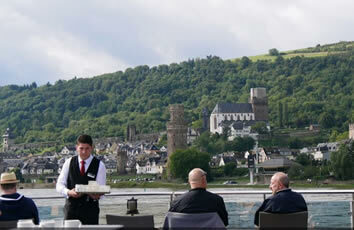 • Rüdesheim – a town well known for its winemaking, especially Riesling wines. 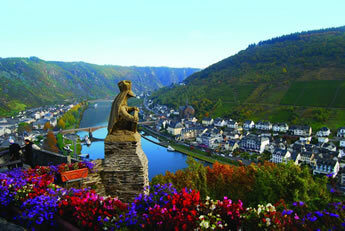 • Rhine Gorge – the most beautiful stretch of the Rhine River with ancient castles. • Koblenz – one of Germany’s oldest and most beautiful towns and a UNESCO World Heritage Site. • Cologne Cathedral – Germany’s largest cathedral and a UNESCO World Heritage Site. To help prepare you for your vacation, we will email a booklet prior to your cruise, which contains helpful tips and advice in preparing for your vacation. We encourage you to read this information carefully and to bring it with you as a reference during your travels. While traveling, please keep in mind that patience, understanding and the flexibility to adapt to a changing environment will enhance your vacation experience. Despite careful planning, unavoidable circumstances may require last minute changes to your itinerary. However, we have discovered that these deviations often reveal unexpected discoveries. 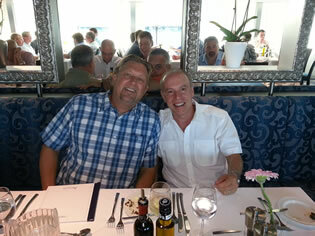 Please advise us at least 30 days prior to departure if you have any special dietary requirements. We will make every effort possible to accommodate your requests, however, please note that local conditions and seasonality can restrict our ability on occasions. Brand g Vacations strongly recommends the purchase of travel insurance to protect against unforeseen circumstances that might prevent you from traveling with us or unfortunate circumstances during your trip. Travel Insurance is an excellent way of protecting your vacation investment. We recommend Travel Guard, however you are welcome to shop and compare plans from other companies to find the best fit for you. Haydn Deck. (16 m² / 172 sq.ft.) with panoramic window. Spacious bathroom, small panoramic window (cannot be opened), spacious wardrobe, choice of bed configuration (double or twin bed), flat-screen television, individual climate control, en-suite bathroom with shower/WC, hair dryer, direct dial telephone and in-room safe. Cabins with connecting doors are available on request. Initial deposit is $850 per person, with final payment due by May 18, 2020.